When we meet him, Jackson is knackered. The premiere of The Hobbit: The Battle of the Five Armies is looming and he’s been working round the clock to finish the film. His voice is deep and throaty, like he’s fighting off a cold, as he collapses into a sofa with a mug of tea resting on his knee. Jackson instantly perks up answering the questions we’ve gathered from the actors who’ve worked alongside him and who know him best, including Martin Freeman (Bilbo Baggins) and Andy Serkis (Gollum). When I mention that the Time Out team has just been watching the new Star Wars trailer while we’ve been waiting, he begs me to say no more: he’s saving it for later. He truly is the movie geek’s movie geek. 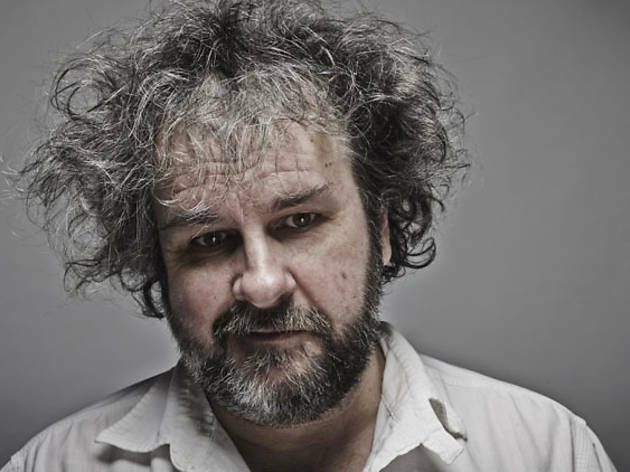 Time Out: Fifteen years ago you were in New Zealand shooting The Lord of the Rings films. Here we are, a decade and half later and you’ve finished the third and final The Hobbit film. Did you throw a party? Yeah, we only finished tweaking it [a couple of weeks ago]. We worked around the clock, 20 or 22 hours a day. The last day lasted 40 hours straight with no sleep. The team around me worked shifts and I just sat there. Then a man in a white suit comes and takes it away from you! Did I celebrate? You just go home and sleep! TO: Are you happy with it? It’s my favourite of the three. It’s a thriller. Each film has its own vibe – even though I made them all at the same time. Each one has a personality, like when you have three children. They may all come from the same gene pool but they have distinct little characters. This one is definitely the thriller. Ian McKellen: Do you think the Tolkien Estate would ever permit a Middle-earth theme park like the Harry Potter one in Florida? If so, having kept so many of the films’ props and costumes, might you want to be the curator or designer of such a place? 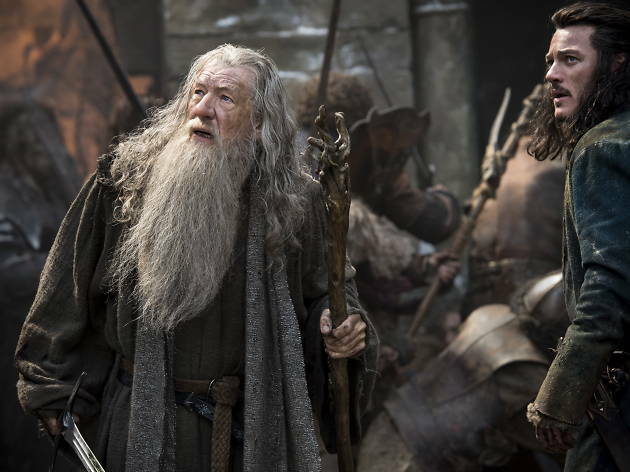 Ian McKellen: Do you have a favourite shooting location out of the six films? I do, and it’s a place I don’t think Ian McKellen ever went to. It’s called Poolburn Dam and it’s where we shot Rohan. It’s in The Lord of the Rings: The Two Towers, and it’s where Aragorn and Legolas are running around trying to hunt down Pippin and Merry who have been kidnapped. It’s sort of rolling prairie land with big rock formations. It’s just a great location. You can’t see a single house for 360 degrees. It’s a vast, epic landscape of emptiness, and it’s quite evocative. So that was my favourite, yeah. 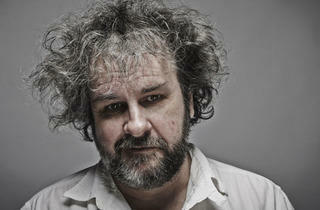 Martin Freeman: Was it difficult to take over the helm for The Hobbit from Guillermo del Toro? [Pacific Rim director Del Toro pulled out of directing The Hobbit in 2010.] Oh, and thanks for an amazing couple of years. Yeah, it was difficult. It was never part of the plan. Guillermo was going to direct the movies and we were going to produce them. So Fran [Walsh, Jackson’s wife, co-writer and producer] and I had other films that we were thinking of making. I know Guillermo would have made something very, very interesting. But beyond him I didn’t really have another director I felt comfortable with. It was easier for me to jump in. The irony was that once I did, I was incredibly happy. It was the most fun I’ve had making a movie. It truly was. I also learned a lot. I felt I came of age as a filmmaker doing The Hobbit. So I’m really grateful for it. I’m raring to make other films. I’m in the zone now. Stephen Fry: When are we going to start on Dambusters? Well, we have started on Dambusters as Stephen and I wrote a script for it a while ago. I love the 1950s, British, Second World War genre. That was one of the movies on the list that I was intending to get made while Guillermo del Toro was doing The Hobbit, so hopefully within the next year or so. If you wouldn’t mind just passing that on to Stephen please? He can read it here! Evangeline Lilly: What’s the worst thing about wearing shoes? Normally I don’t wear shoes. They’re just uncomfortable. I don’t like wearing them at all. But socially you’ve got to, on red carpets and in restaurants. I’m not that much of a rebel. I also wear them on set because it’s too dangerous. If someone dropped a piece of equipment on my toe there would be all sorts of insurance complications. Evangeline doesn’t wear shoes when she’s off set. So that makes two of us. TO: Do you get a kick out of knowing how many people are watching your films? Yep! I think it’s pretty exciting, hugely exciting! Thrilling. Especially having been brought up in the low-budget splatter genre, where you’re making films for a limited audience. When I go around the world now and I look up and there’s a poster for one of my films, I think: do all these people actually go and see my movies? Wow. It’s hard to connect to that. And you can't make a movie by committee – especially a committee of 25 million people or however many. You have to make it for yourself and hope other people trust your instincts. Andy Serkis: If you could confront and defeat any tyrant in history, literature, cinema or popular culture who would it be? It’s a very tricky thing, isn’t it? Obviously Hitler would be at the top of the list. If you could nip that in the bud, the world would be a much better place today. But it’s not something I really think about, I must say! That question tells you more about Andy than it does about me! It must be something that he dwells on quite a lot! TO: Do you think The Lord of the Rings and The Hobbit changed what we expect from movies? I don’t know, I can’t really answer that. I certainly hope one day that some filmmaker, a reasonably well-known filmmaker, will come up to me and say: ‘Hey, I’m only doing this because I saw The Lord of the Ringsor whatever when I was seven years old…’ I met Fay Wray, the actress from King Kong, when she was in her 90s just before she died. I was able to say to her: ‘I’m only doing what I’m doing because of seeing your film that you made in 1933.’ That was a pretty weird experience. Benedict Cumberbatch: What are you most proud of? I hate those sorts of questions! Well, I’m most proud of entertaining people. That’s ultimately what I do, it’s not like I make any bones about it. The business I’m in is the entertainment industry, and there’s nothing romantic about it. I have to entertain people, which I love doing anyway. But Warner Brothers expect me to, otherwise they’re going to lose their money! What I’m personally proud of is when people are clearly enjoying something you’ve made – when you’ve successfully taken people away from their normal lives and their stresses and you’ve let them have some escapism for an hour or two… Or three in my case! Ha! TO: Some of the world’s biggest filmmakers – Steven Spielberg, James Cameron – come to you for advice or help. How does that feel? That’s one of the perks if you’re lucky: to collaborate with the people you grew up admiring. They were the ones who inspired me. I said to Steven: ‘I’m the perfect age, I’m the clichéd version of not wanting to go into the water when I was 12, 13 years old because of Jaws… I lived by the beach and every summer we used to go swimming for months. And in 1974 my Christmas was ruined because of Jaws!’ When you meet people like Steven and Jim Cameron, you understand that they’re the same as I am – just big kids, big geeks. We’re all just geeks. TO: You’ve made one of the most successful franchises ever and realised a lifelong ambition. What’s left? One of the things I’m thinking about now is the future of entertainment. TO: One hundred years from now, what’s it going to be like? I haven’t a clue. What interests me is augmented reality and virtual reality. Not so much virtual reality like putting on headsets and entering another world. It’s more that you put on glasses, go out the door and there are zombies walking around. You’ve got a plastic gun and you’re chasing them. That’s kind of interesting. Ten years from now it’ll be everywhere. It’s not gaming, it’s a form of entertainment that doesn’t exist yet. I’m interested in putting my brain into that – when my brain cells have recharged a bit. 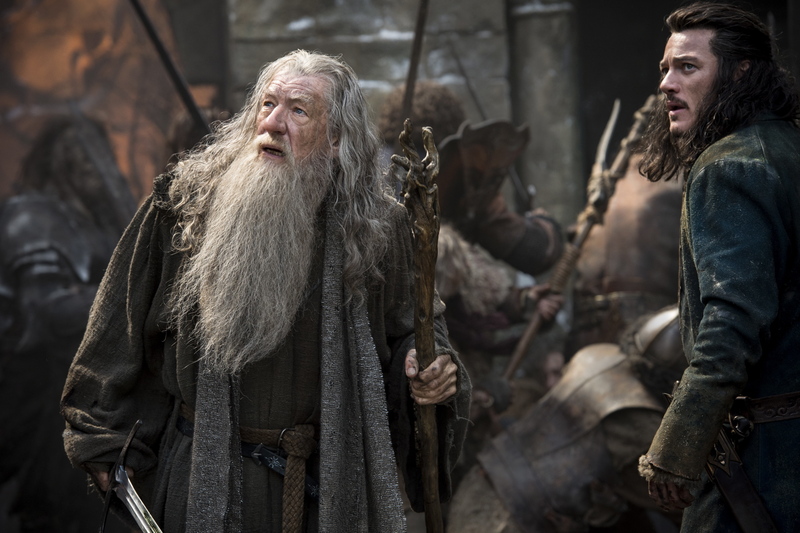 The Hobbit: The Battle of the Five Armies opens on Dec 18 in Singapore.